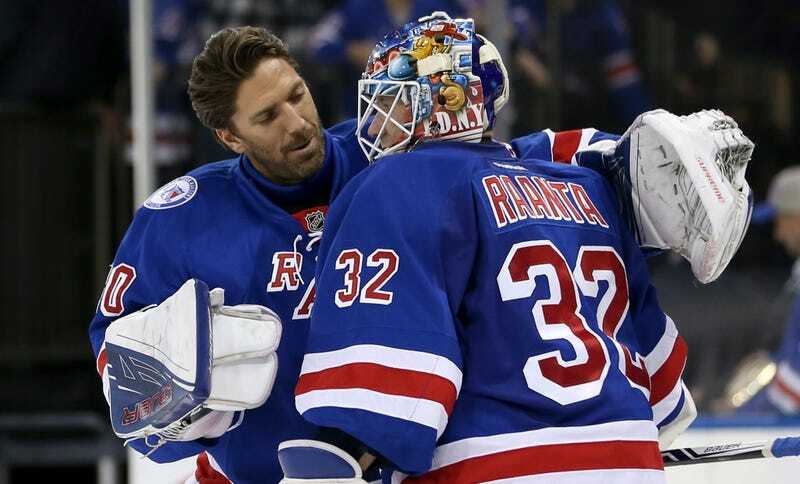 When Do The Rangers Start Worrying About Henrik Lundqvist? Is this time different? Well...it’s closer than it’s ever been to being something new and scary, even if the timeframe is still wide open. Antti Raanta will make his fourth straight start in net for the Rangers tonight, and he’s been lights out. In 11 appearances, the 27-year-old Finn has gone 8-1 with a 1.65 GAA and a .943 save percentage. He’s rolling, with a shutout streak of 151:04, and became the first Rangers goalie since Mike Dunham in 2003 to post back-to-back regular-season shutouts. It’s not as simple as that. Lundqvist hasn’t been good. His rough season was covered up by some unreasonably, unsustainably high scoring by the Rangers early on, but once the offense came back to earth, Lundqvist’s numbers are harder to ignore. In 21 appearances he’s got a 2.55 GAA and a .912 save percentage, both the worst figures of his career. But the undrafted Raanta is relatively young, and hasn’t really had much opportunity to succeed or fail. He was awful for Chicago behind Corey Crawford in his rookie year of 2013-14, and excellent in very limited action the following year, even as he lost his backup job to Scott Darling, who has since rewarded the Blackhawks’ confidence. Raanta was traded to New York before last season and was solid, but no one could have expected this. Lundqvist’s teammates don’t appear to be worried, but even they can’t help but notice that this is approaching uncharted territory. “It’s a situation [Lundqvist is] not used to or anyone else is used to,” Marc Staal said. “But Antti’s playing really well. Hank’s been working hard and he’s been supportive in the room and all those things. Goalies get hot; it’s a weird, streaky position. Antti Raanta is not going to stop 94 percent of pucks for the rest of his career. The corollary is that they get cold too. To that end, Lundqvist’s play this season might be an anomaly, but it’s also nothing that can be laughed off. He’ll turn 35 in March, and the goalie age curve is a real thing, even for the very best of the best. (There’s a drop-off around age 30, which is where Lundqvist’s numbers peaked, and then a real cliff in the mid-30s.) Even if Lundqvist is slumping, a natural decline would put Lundqvist’s stats about halfway between where they are now and where they’ve been the last couple years. He’ll be better than this, but it’s not rude nor wrong to say his best years are behind him. It’s also not crazy for the Rangers to start thinking about their goaltending future, a future complicated by Lundqvist being in just year three of a seven-year contract with an $8.5 million AAV. The Rangers, sitting second in the Metropolitan, have some leeway to figure out their immediate goaltending situation, but not all that much—there’s a huge logjam in the Metro, with the top five teams all within four points of each either, and all on pace for huge point totals this season. Their red-hot start hasn’t resulted in all that much of a cushion. They’ve got to do what, fundamentally, all teams must, even if their goaltender has a hall-of-fame résumé and an enormous contract: go with the hot hand.